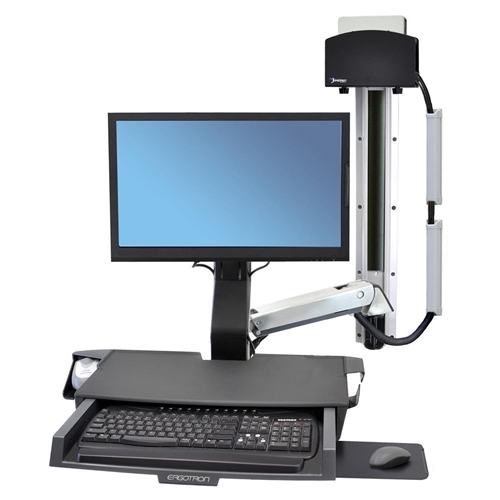 The Ergotron StyleView® Sit-Stand Combo System with Worksurface provides easy re-positioning of your entire workstation—move your display, keyboard, mouse and barcode scanner in a single motion! Durable polished aluminum construction! Also features a worksurface with pull-out keyboard tray, which facilitates caregiver workflow. Work sitting or standing with the arm’s ergonomic 25" (64 cm) LCD height adjustment range. A unique cable management system conceals and organizes cords, making cleaning easy. • Extend LCD and keyboard up to 43" (109 cm) from wall; fold equipment back out of the way when not in use. • Complies with all international environmental regulations related to its design, manufacture and packaging.